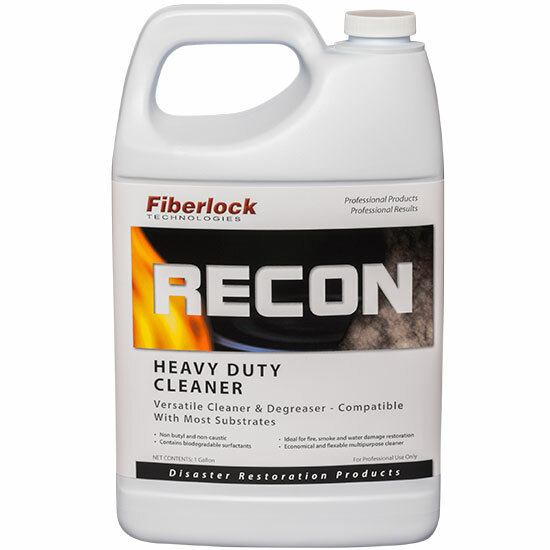 RECON Heavy Duty Cleaner is a powerful cleaner and degreaser that is extremely effective in the removal of heavy accumulations of grease, oil, fats, carbon, ink, wax, dirt, soot, tar, asphalt, creosote, rust stains and many soils. Its fast-acting, powerful solubilizing agent dissolves and suspends any soil, allowing it to be wiped or rinsed away completely. Dilute 2 ounces of concentrate per gallon of water. Dilute 3 or 4 ounces of concentrate per gallon of water. Dilute 6 to 8 ounces of concentrate per gallon of water. Apply a liberal amount of solution onto the surface to be cleaned and allow to stand for a few minutes to allow product to penetrate into soil. Brush or scrub surface and pick-up. Rinse thoroughly with clean water. For daily maintenance of non-industrial floors, dilute 3 to 4 ounces of concentrate (depending on soil conditions) to each gallon of water in the solution tank. For use in heavy industrial applications: Dilute 8 to 12 ounces of concentrate (depending on soil conditions) to each gallon of water in the solution tank. Adjust spray nozzle to deliver 1 part concentrate to 30-60 parts water depending on soil conditions. Rinse thoroughly with clear water. These directions are flexible rather than specific. In many cases a more dilute solution can be used, while for extreme conditions a less dilute solution may be used. Always test sensitive substrates such as marble, tile, and painted surfaces in an inconspicuous area to determine if the solution will adversely affect the target material.